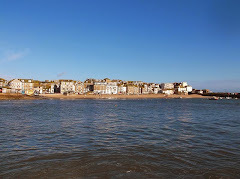 St Ives Cornwall Blog returns after a short break! Apologies to regular readers for the absence of posts over the last week or so - I've been enjoying a break in Spain. So I'll start with my regular review of what's going on over the next week. 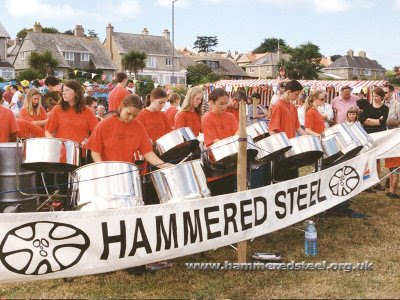 Tonight there's a Caribbean Evening at The Guildhall with St Just based band Hammered Steel. I've seen them perform before and they're a great young band. This is also a fundraiser for St Ives Lions so well worth supporting. A free glass of Caribbean punch with your ticket - dress up if you want. Tickets: £8.00 (adults), £4.00 (children). Available from St Ives Tourist Information or on the door. On Sunday you could check out the new Harry Potter movie - The Half Blood Prince - at The Royal Cinema. We went to see it last week and its the best yet. Its also on every day throughout the week - 13.45, 17.15, 20.45. Tickets: £6.00 (adults), £4.00 (children and OAPs). Do what we did and get tickets in advance to avoid the queue and get the best seats. On Monday evening there's a Life Drawing Class at St Ives School Of Painting. Starts at 19.30, no need to book just turn up ten minutes before. Doors open at 20.00, music from 21.00. Wednesday is Karaoke Night at The Sheaf Of Wheat with local legend Freddy Zapp. Starts at 20.30 free entry. On Thursday night Cafe Frug returns to St Ives Arts Club - hosted by Bob Devereux. An eclectic mix of music, poetry, prose, film and whatever else people feel like doing. Entry £4.00 on the door, starts around 20.00. On Friday night you could explore a little culture with Late At The Tate. Starts at 19.00 with music food and BBQ on the roof terrace, galleries open until 21.00. Have a great week in St Ives. As ever there is loads more stuff going on - some of which is on my St Ives Cornwall Events Calendar. If you want me to plug your event let me have details along with the usual incentives and I'll think about it. Earlier in the week I reported that some of the planned Arts Programme had started to appear on the "official" festival website. This process has now mysteriously halted - with events listed up to Wednesday 16th September but only the Guildhall and Western gigs after that. Rather oddly some are listed as taking place in December 2008 - I suspect they are having trouble with their content management system. 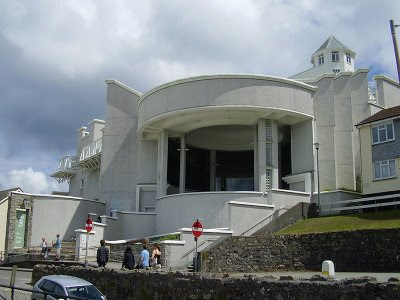 So I thought I'd continue my series of previews - with what's on at Tate St Ives. The main exhibition from now until September is Contemporary Fine and Applied Arts: 1928–2009. Open daily 10.00 - 17.00. This includes work by Katy Moran (artist in residence), Carol Bove, Barbara Hepworth, Lucie Rie, Alfred Wallis, Bojan Šarčević and Lawrence Weiner. I haven't had a chance to visit yet but it looks like an interesting combination - apart from the inclusion of the ridiculously overrated Wallis. Talking Painting - Saturday 12th September 11.00 - 12.30. Explore new perspectives on work in the current exhibition through picture description, discussion and practical art activities. Designed for visitors with visual impairment but open to all. Free but booking required. Tea and Tate - Monday 14th September 13.30 - 15.30. A regular event for seniors, explore the exhibitions led by artist educators and take part in lively discussion. No knowledge of art required. Refreshments provided. Free with gallery admission, booking required. Hepworth Garden Walk and Talk - Monday 14th September 18.00 - 19.00. Join Head Gardener Chris Green for an insightful tour of sculptor Barbara Hepworth's sub-tropical garden. Tickets: £7.00 or £5.00 for Tate members. Late at the Tate - Friday 25th September 19.30 - 23.00. An evening of poetry and blues with Billy Childish - "A cult figure in America, Europe and Japan, Childish is by far the most prolific, painter, poet, and song-writer of his generation." In the café which will be serving food and drinks. Free entrance to the gallery exhibitions and shop which are open until 21.00. More festival previews coming soon. The week ahead sees quite a few events - as usual I'll highlight a few, a fuller listing is on my St Ives Calendar. Sunday is Ayr Field Day - a full day of free fun for all the family in the heart of St Ives. There is a whole load of stuff going on - some of which I previewed earlier this week. All welcome. More details on their website. On Monday night Freddy Zapp is back at The Sheaf of Wheat with his Karaoke Roadshow. 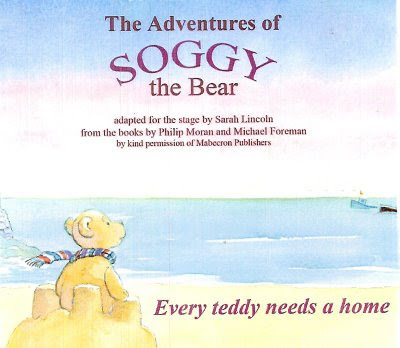 Tuesday sees the opening of Soggy The Bear- a children's theatre production based on the books by Phil Moran and Michael Foreman. St Ives Theatre - 10.30 and 14.00. This then runs throughout the summer, at the theatre until 17th July then at St Ives Arts Club. On Wednesday there is the regular Life Drawing Class at St Ives School of Painting. Starts at 19.30 - no need to book just turn up 10 minutes before. On Thursday there is St Ives Farmers Market at The Backpackers on The Stennack. Starts at 09.30 and closes at 14.00 - loads of nice local food and produce. On Saturday Stackridge are at The Guildhall - the biggest gig of the month. "The missing jewel in the crown that is British pop music"
or Ticket Hotline: 08000 588001. I previewed this earlier in June - but as Ayr Field Day is this Sunday - 5th July 2009 - I wanted to mention it again - please go along to support this great community event. A full day of free fun for all the family in the heart of St Ives. 11.00am to 4.00pm. 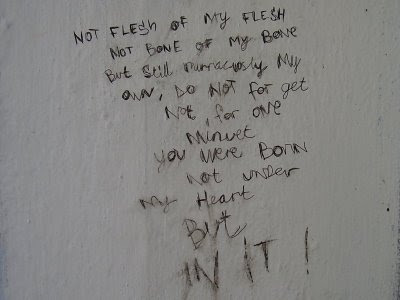 I spotted this graffiti on a wall along Fore Street. "The Answer (to an adopted child)".